Welcome to my annual coverage of the 2018 K2 summer climbing season. I will be reporting from my home in Colorado this year based on my personal experience of our successful 2014 K2 summit and covering the action the last three years. I try to report on K2 in the same style as my annual Everest coverage but accurate information is much more difficult to obtain from Northern Pakistan than from Nepal. I’ll do my best to throw in occasional coverage for climbers on Broad Peak, Nanga Parbat and Gasherbrum I and II. As always, I use my blog to raise awareness of Alzheimer’s and if you appreciate my coverage, please consider a donation where 100% goes to Alzheimer’s non-profits and nothing ever to me. Read more about why this cause is so important at this link and how Alzheimer’s took Ida Arnette’s life. As I discussed in a post a few years ago, “Why K2 will not become Everest“, K2 is a totally different climbing experience requiring a honed set of skills and alpine experience. It is the second highest mountain in the world at 28,251’/8611m and remains the only 8000er not summited in winter. The climbing is technical – meaning you are using feet and hands to climb; the exposure is dramatic – meaning if you fall you will most likely die; and the weather is extreme – meaning it is less predictable due to standing alone to the west of nearby mountains thus creating its own systems. It is common to have very different conditions on K2 than on Broad Peak or the Gasherbrums that are only a few miles away. Unlike Everest, there are no long, flat sections i.e. the Western Cwm. K2 starts steep, ends steep and never lets up. 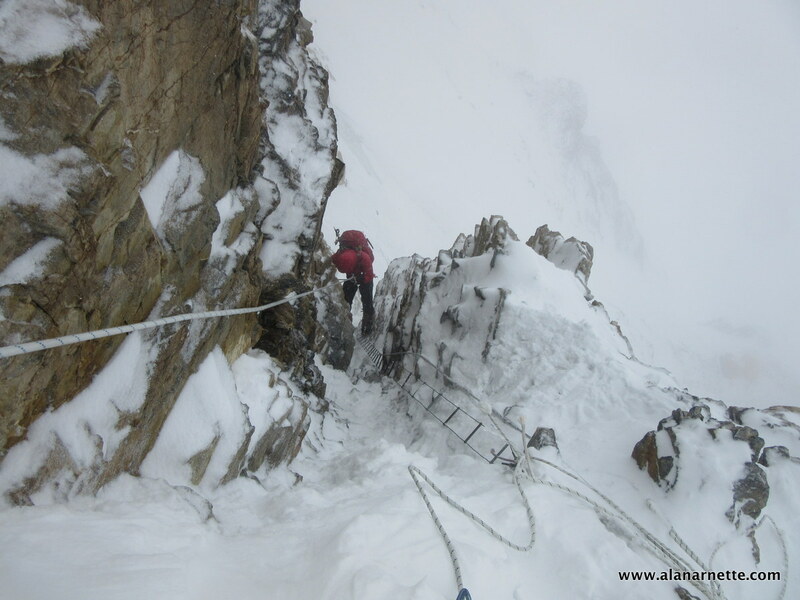 Objective dangers are constantly on the minds of K2 climbers. Avalanches and rock-fall are rampant and injuries are common. These are not bravado or ego-based comments on my part given I have summited both peaks, but my effort to help readers understand that K2 is in a different league than most of the other 8000ers. Just because you summited Everest, doesn’t mean you are ready for K2. 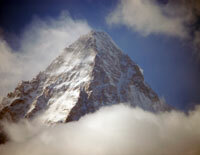 A bit of trivia, there are less than 200 people who have summited both Everest and K2. It is well documented that K2 sees significantly more deaths than Everest. Thru 2018, I estimate 8,950 summits by about 5,500 people and 295 deaths on Everest – 3.3% compared to 367 summits with 84 deaths on K2 – 23%. Of the 8000 meter peaks, Everest has the highest absolute number of deaths at 288 but ranks near the bottom with a death rate of 1.23. Annapurna is the most deadly 8000er with one death for about every three summits (71:261) or a 3.91 death rate. 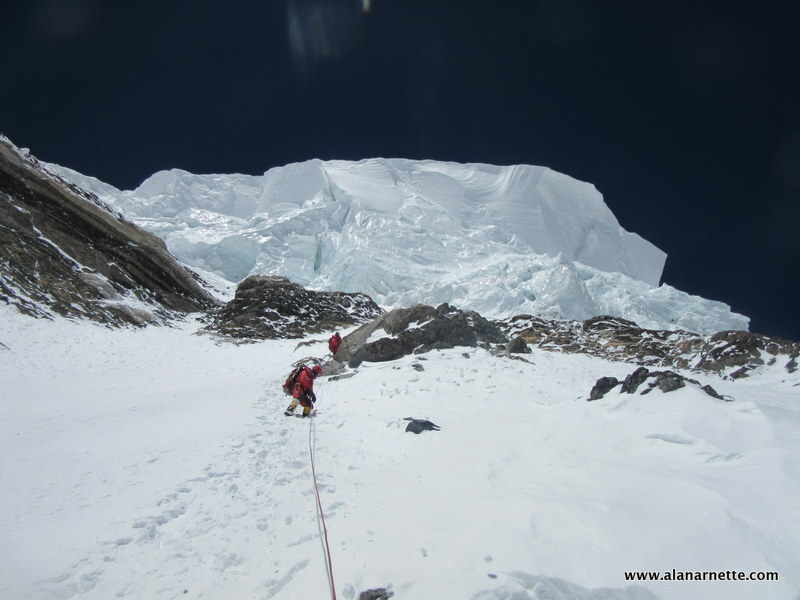 Cho Oyu is the safest with 3,681 summits and 50 deaths or a death rate of 0.55. While some will quibble with these statistics, it is a measure of risk. The number one reason listed for death on K2 is “disappearance” suggesting that the climber fell in a highly exposed area, was blown away by winds or buried in an avalanche. 33 climbers have died while descending from the summit. 11 died in 2008 including my friend Gerard McDonnell when the towering ice serac just below the summit let a tiny fraction of its 100 meter vertical face loose. If you attempt K2, you must accept that dying is a real possibility. The first summit of K2 was on July 31, 1954, by Italians Lino Lacedelli and Achille Compagnoni. The first attempts began in 1902 by Brit Aleister Crowley. But it was the Duke of Abruzzi who made the most valiant attempts in the early 1900’s thus named the ridge most popular used today, the Abruzzi Spur. After five separate American attempts, Louis Reichardt and Jim Wickwire summited on September 6, 1978, and John Roskelley and Rick Ridgeway the next day. Amazingly Jim Wickwire spent a night in the open just below the summit at 27,000 feet without food, oxygen, or shelter in temperatures of -40 degrees. According to 8000ers.com, plus my own research, from 1986 to 2016 there were 12 years with no summits. From 2009 to 2016, there were only three years with summits – 2011 only from the Chinese side by Gerlinde Kaltenbrunner who became the first woman to get all the 8000ers san Os. In 2012 and 2014 each saw about 30 – 50 people summiting – record-breaking years as a result of a week of excellent and rare summit conditions. Everest went from 1974 to 2014 with summits every year – 40 straight years! The best year ever for K2 was in 2004 with 51 total summits followed by 2014 with an estimated 49 summits, including six female climbers. 2017 was a mixed year on K2 with most teams choosing not to risk a summit push but one strong Sherpa team gambled and made it for the first summits since 2014. Lead by Mingma Gyalje Sherpa, 31, founder of the Nepali guide company Dreamers Destination, now Imagine Climb. This was the second time he has guided a team to the summit, 2014 was his first. Long-time legend Russell Brice’s Himex team attempted the Česen route but stopped due to dangerous conditions and all the other teams on the Abruzzi stopped their attempts after an avalanche wiped out Camp 3 and Advanced Base Camp burying most of their gear. Of course, K2 saw a rare winter attempt just six months ago. It ended poorly with botched logistics, in-fighting within the team and just plain old bad luck with the weather and snow conditions. As if that was not enough, several members of the Polish team left K2 in the middle of their acclimatization work for a rescue mission on nearby Nanga Parbat. You can read my full coverage of these events at this link. There are 9 named routes on K2: Česen, Northeast Ridge, North Ridge, South Face (Central Rib), South-southwest Pillar (Magic Line), Northwest Face, Northwest Ridge and West Face with the Abruzzi Spur aka the Southeast Ridge. No one has climbed the East Face, due to the instability of the snow and ice formations on that side. There are no easy routes on K2. The overall number of climbers and teams are a bit low this year according to Karrar Haidri, Secretary Alpine Club of Pakistan. He told me “The situation in Pakistan much better then the year  of Nanga Parbat incident, but the international media is giving one-sided story, unrest is in limited area of Pakistan, Gilgit Baltistan is now the safest place on earth, after Nanga Parbat incident n special force has been established now on KKH, and also due to CPEC route the area is fully controlled by law and orders agencies.” On a side note, I felt safe and never in danger when I was climbing in Pakistan in 2006 and 2014. I will not be keeping a location table like I do for Everest given the lack of detailed information. These are the teams reported to have climbing permits for the Karakorum this summer in Pakistan. Keep in mind that all foreign operators must use a local Pakistani owned and operated company to obtain permits. Also they have been required to hire Pakistani High Altitude Porters and discouraged from bringing Sherpas from Nepal/Tibet to support their teams, however many teams do albeit at a higher expense. A few of the teams are back after being stopped in prior years. Maddison Mountaineering has a large team of 10 members, 2 guides, 11 Sherpas and 5 Pakistani High-Altitude Porters aka HAPs. Dan Mazzur’s Summit Climb is running a Broad Peak/K2 trip as is Furtenbach. Seven Summits Treks is there providing logistics for most of the other teams in addition to having their own team. One high-profile team is Japanese mountaineer Akira Oyabe who has been preparing for two years. They arrived at the end of May in Pakistan to get a jump of other teams and hopefully have the time to wait out poor weather. This is Oyabe’s third attempt after bring stopped by high winds in 2009, and heavy snowfall in 2013. 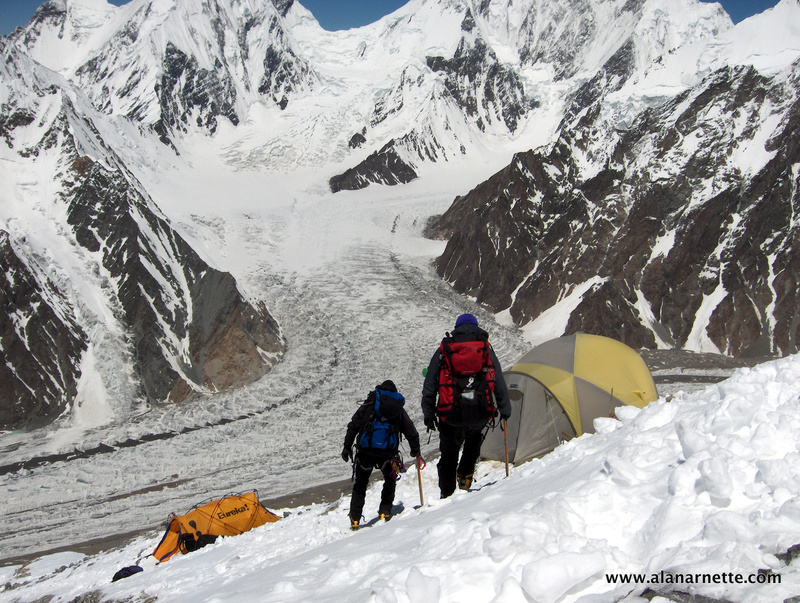 However by now, many teams have arrived in Pakistan and are making the 8 day hike up the Baltoro Glacier enjoying some of the most spectacular views anywhere in the mountains. David Roeske for BP and K2. In 2016 the American summited Cho Oyu and Everest within 11 days. At 26,362’/8035m. GII is often considered the most attainable of the Karakoram’s 8000ers. There have been about 350 summits of GI and 940 of GII. The ‘Killer Mountain’ has a deadly reputation not only for climbers but also as the site of the 2013 massacre at base camp where 10 people were savagely killed allegedly by terrorists. At 26,660’/8126m Nanga is known to be one of the more technical 8000ers. – some will say harder than K2 by some routes. South African-born Swiss explorer and adventurer, Mike Horn who took the infamous photo of a decapitated head on K2 in 2015 is on Nanga Parbat. Turkish climber Tunc Findik with his Romanian partner Alex Gavan, is hoping to get his 12th 8000er. There have been around 380 summits on this difficult peak. BP is often considered a warm-up for K2 but that grossly understates the difficulty of this 26,414’/8051m peak. About 425 people have summited Broad. Every season people talk about summiting both but it is rarely accomplished as I described in this post last year. The most recent double for Broad Peak and K2 that I can remember, was in 2014 by Bulgarian climber Boyan Petrov. I passed him descending from the summit as he was going up near Camp 2. He was young, strong and confident so I wasn’t surprised to learn he had summited. Sadly, he perished on Shishapangma this year. If you are wondering about summer climbing in Nepal and Tibet where the other nine 8000ers are located, the summer monsoons usually prevent that. The monsoonal flow avoids hitting Northern Pakistan in July and August, but that pattern has been known to change as was experienced in 2015 and 2016. If you have a team and want coverage, please contact me. Best of luck to all this summer. Hoping the winds are calm like they were on Everest last month and the K2 climbers nab a summit of two. Can you explain me how death rates are calculated? I would like to know this, too. The percentages are straightforward, but I am missing something on how the death rates are calculated. Is it perhaps based on the unstated total climbers figure rather than summits? iii) Mingma G. Sherpa (Nepal). Rakoncaj is the only mountaineer who has climbed the mountain from both the North and the South side (Abruzzi Spur) without using supplemental oxygen. Fazal Ali achieved the feat twice from the South side without using O2. Mingma G. was twice successful from the South side while using supplemental oxygen during his first successful attempt. Thanks for your comment Farhan and helping to raise the visibility of these climbers. Can’t wait for more news. Thank you Alan! Dear Alan. If I click on the link I can’t read your post about K2. I just see some comments. Something wrong maybe? Same problem. It just goes directly to comments. No blog post at all. Winter Everest and K2 – Can They Summit? Similar problem here. Can see blog post heading but can’t read the blog. Supplied links not working either. Looking forward to reading your K2 blogs. Great work. Change to desktop version, works also with mobile device. Somehow mobile version on Safari or Chrome won’t work, Alan you might like to check blog source for mobile version as desktop version works perfect. Great blog btw. and good speed for my friend Fredrik Sträng to sneak in K2 summit this summer! Thanks Mikko, should work on mobile now – it was a firewall problem. Thanks Brian – should work on mobile now – it was a firewall problem. Can you let me know if it works? I’m really thinking about trekking to the K2 during the window when most summit attempts take place (late july/early august), but whether I do so will depend on how busy I am at the time. I do expect another tough year for K2 climbers. Good luck to them, and I hope that we have no injuries or fatalities. It’s a tough trek but amazing views. Agree with all above and will add my joy as you change boots for the Summer climbs. I have shadowed you for a few years now, pre Blog, so it’s like old friends dropping by with the news when my notification hits. I always look forward to K2 season so much more than Everest since Everest has turned into nothing but a log jam. By deaths I mean those of the past two years, I don’t want someone to read my comment and think there was a new death mentioned in your post. Thanks. I knew what you meant but appreciate the consideration. Thanks for this Alan. I avidly read your blog for content. There are a lot of us interested in these mountains who may never go. Your reporting gives us a window into the climbers and their lives. I have to say the tragic deaths of great climbers hits me hard. I know they need to accept they could die, but I feel they push themselves to climb out of a love for life and grabbing all they can from it.